Although individual consumers may be reluctant to trade in their gas guzzlers for electric vehicles, public transit departments have already been experimenting with these low-emission alternatives. But the challenges of electric transportation are the same for municipalities: mainly, how do you keep the vehicles fully charged without constant interruptions to the travel schedule? 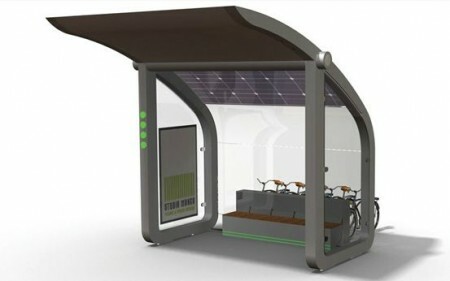 The ATC Solar Curve Bus Stop concept by Studio Mango, featured recently on Design Buzz, could be an answer to this conundrum. 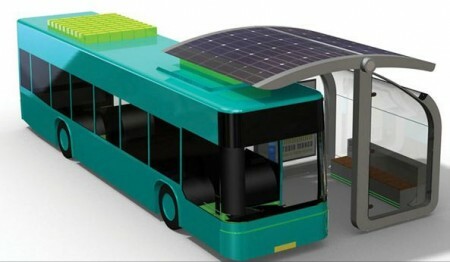 Designed for integration with existing bus stops in the Dutch city of Noord-Brabant, the Solar Curve would place inductive charging technology into bus stops that would allow electric buses to recharge their batteries every time they stop to pick up passengers. Inductive charging uses an electromagnetic field to transfer energy between two objects. Energy is sent through inductive coupling to an electrical device, which then can use that energy to charge its batteries. Approximately 15.5 meters of solar panels installed on top of the structure’s roof would collect and convert sunlight into electricity throughout the day. The roof would be curved in such a way that would both protect waiting passengers from the elements and allow the energy to be transferred to the bus wirelessly anytime the vehicle pulls up underneath the overhang. Components for inductive charging are hidden and protected against damage or dirt in the Solar Curve’s tilting roof construction. Green LED lights on the bus stop/charging station that can be read very easily by the bus driver as well as the waiting public would indicate when the bus is ready to hit the streets again.